A client hires you as a designer. You walk through the proposal and describe the process and procedures you feel, as a professional, would be best suited. The client agrees but has a vision in their mind that they want realized. Perfectly understandable. As you finish up the first round our two, you present your work. You feel it is a great solution for your clients needs. However, the client isn’t seeing their vision in the presentation. What? They want to change it? But its practically the perfect solution. After they have explained what they want, you realize their vision might not be the best. It could either be outdated, an aesthetic killer, or just plain bad…legitimately. On a side not: clients can have some great ideas. I’ve seen them. So do not let pride get involved in these situations. However, in this case lets say that the client’s idea would hurt their image. Now, you have to decide whether or not to say something. Do you say that you disagree or just bite the bullet and do as they ask? As a rule, the client is the one paying. However, they hired you for your professional abilities. So, rather than viewing the situation as a struggle. Choose to approach it as an advisor. Explain why what you have designed for them suits their needs. Do not complete rip their idea to shreds. Just let them know why it “might” not be the best approach. During these discussions I tend to say something along the lines of, “in my professional opinion/experience.” I’m really into the theory behind design so I will through in some buzz words and explain how both of our approaches will effect their audience. I feel like it is my duty so speak up but not with the only purpose being to win them over. In the end, the customer is always “right” and I will design what they want to the best of my ability. Thankfully the conversation I had with my friend helped organize my thoughts. This was something I had been thinking about for a while. 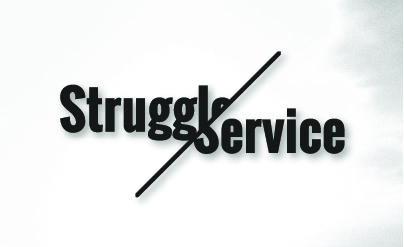 And take-away a got from it all was, it is not about the struggle, it about providing a service. This is a great post and one that I have dealt with several times. It can be frustrating as a designer to have clients have outdated or bad “visions” of what that want. In the end, you are looking for a happy client and to help them succeed. A mutually beneficial agreement may take a few rounds to get to, but there are better approaches to be taken. Good post. Be sure to review it for typos. There are a few. I would hate for you lose credibility for your good idea due to a lack of fine tuned proofreading. Just a tip from one designer to the next.